Do you keep your rabbit inside your house all the time because you fear that some harm can come to it? There is not so much to fear, there are rabbit runs available in stores or you can make one, so your rabbit can have more fun and exercise and be the rabbit that it is. Those who have rabbits for pet know that rabbit need exercise, sunlight and plenty of fresh air. Keeping the pet rabbit in the house or in a cage, without so much human interaction and without a companion almost always leads to boredom and destructive behavior such as chewing anything they can get near. Letting the rabbit in the yard, on the other hand has its risks. For one thing, because your rabbit is basically a herbivore, it could chew leaves of poisonous plants and cause it to be sick or die. Even the grass or non-poisonous plants could have been sprayed with herbicide or chemical fertilizers could have been placed at the base of the plant. All these are hazards to you're per rabbit. In addition, their might be spots in your yard infested with fleas. Those hazards could create more problems for you and your pet than just keeping it inside your house or in the hutch. If you have made your yard safe for your rabbit, your potential problem does not stop there because rabbits are animal preys and so it has to contend with their natural predators like dogs and cats, foxes, opossums, weasels, and raccoons. If they are loitering in the yard, they are also easy targets for hawks and even owls. 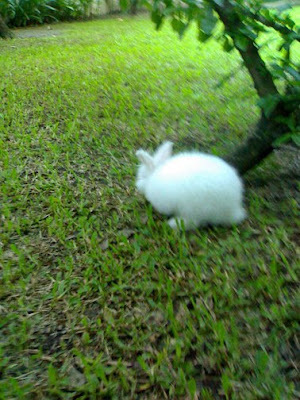 Pet rabbit owners usually go around this problem by providing rabbit runs for their pets. They either buy one from the shop within the vicinity where they live or go shopping online. Selecting which of the rabbit runs you find is best for your pet can be easily done if you know what you are looking for in a rabbit run. For one, it should provide a wide space for your pet to run around and play. At the same time, it must be small enough to be able to move it when you need to. A standard run is one which is made of wood and wire mesh which usually are made of materials that can easily destroyed and gnawed by the rabbit. Fox proof runs consider the possibility of the rabbit being attacked by predators, especially a fox. To a fox, a rabbit is perhaps one of the most delicious meals it can have. In the first place, a rabbit run made of less sturdy materials can easily be destroyed by a fox. Foxes have been known to be able to jump over a six foot fence or wall, can dig easily and make a tunnel to a rabbit run or even under a fence of a yard just to be able to enter the place where your rabbit run is located. People think that if they have a chicken wire for their rabbit runs, their rabbit is already safe. Foxes have strong and powerful jaws so that chicken wire and plywood are easy jobs for them. Only if the run has the flooring made of strong welded wire that cannot be destroyed by a fox and at the same time one which will not cause injury to your pet's feet. At the same time that kind of flooring will allows your pet to run on the grass. Nor could they be assured that just because they are there supervising their pet while inside the rabbit run, no predator can approach the run. If they are in the city for example, urban foxes have been accustomed to people so that when looking for their prey, they are not scared by the presence of people. If they see their targets, they would not mind the people present. In the face of such a determined predator, what use will your run have, unless it is made of say strong welded wire mesh properly and firmly attached to the wooden frame and the door secured with metal locks or bolts? How about a raccoon which is known to pass through the drainage canal to go places in hunt for their food. The more so if your home is located near a forest. The predators are many and of different kinds. The run must provide some shelter for the rabbit if there is a mild precipitation. This will also serve as a resting place for the rabbit where also it can hide when it sense some danger approaching. Rabbits have sensitive ears and sense of smell. Their eyes can see over a wide angle so that it can even scan the overhead for threats to it. When danger is detected, it can immediately run for cover or hide in its shelter provided for it. This shelter serves also as a shield from the scorching heat of the sun especially during the summer months. A rabbit run is not intended to be the permanent dwelling of your pet rabbit. It should only serve the purpose of play and exercise and having more sunlight and fresh air. It is not advised that you leave your pet there even at night. Rabbits tend to be safer inside the house at night, and for socialization with the family and other occupants of the house. Yes, rabbit runs serve many useful purposes for the rabbit but it is not the cure-all to some problems generated by having such a pet.